This holiday season, give the gift that others will love. If you’re around the area, you may or may not have heard that Shoreline Dental is offering a new patient cleaning special for $149. Rather than getting our name out there, we want to provide our services to you! You could sponsor yourself, a friend, or loved one with a beautiful bright smile with teeth whitening this winter! Shoreline Dental’s uses BOOST professional in-office whitening to get you the best results possible. With 40% hydrogen peroxide, that’s nearly 4x the strength of Crest Whitening Strips and 9x the strength of other over the counter whiteners. You’ll see results in less than an hour that last longer than other leading brands. In our office, it’s simple. We’ll get you seated for about an hour and a half and get to work. We’ll apply a barrier between your gumline and teeth then apply the bleach. Simple as that! There’s a lot of down time between sessions but you’ll be in and out before you know it. Watch a video demonstration from our friends at Opalescence here to get a better idea of what you’d expect during a visit. 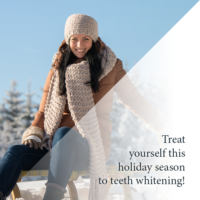 If you haven’t finished you holiday shopping and a teeth whitening gift is up your alley for a friend or loved one, call our office at 206.440.0065 to schedule an appointment. There’s no shame in calling for yourself as well! The brighter smiles we can create, the happier we’ll all be!